Summary : The Orange Spiced Tea is available through Culinary Teas and is a big improvement over supermarket varieties, but is not for me as neither the orange nor the cinnamon taste is really present. Review : I must confess. I was REALLY looking forward to this tea. It was one of the very first loose leaf teas that I've ever ordered. You see, I love cinnamon. And I love orange. So put the two together and, presto, you should make me an instant happy camper. Now, I had tried several varieties of forgettable supermarket orange spiced teas before - and wasn't exactly thrilled about the result. As such, I was hoping - perhaps even desperately - that the loose leaf variety would be to my liking. But alas, it was not to be. 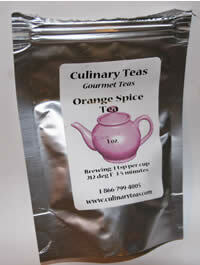 Indeed, the loose leaf variety of Orange Spice Tea I picked up from Culinary Teas was just a, not surprisingly, stronger and more potent tasting version of the supermarket teas I tried. This probably speaks well about this tea, as the stronger taste is a hallmark of loose leaf teas everywhere. And so by tasting stronger, with more flavor, but at the same time quite similar to the supermarket variety, Culinary Teas created a nice Orange Spice tea that isn't different than any other Orange Spice tea around - just stronger. Unfortunately, this tea and me are just not meant to get along. In none of the varieties of Orange Spice Tea I've tried have I really tasted the cinnamon much. And the taste of orange is nowhere to be found. Granted, I like a strong tea - which is why I had such high hopes for this loose leaf variety. Yet, I could not find much in the way of cinnamon in the taste either (unless my version of cinnamon is substantially different than others). And the orange taste is completely missing. And so, it was with a heavy heart, that I exiled this tea to the depths of my closet, never to see the light of day again. So, who will like this tea? If you like the supermarket brand Orange Spice Tea you find - you will absolutely LOVE this tea. Guaranteed. Why? Simple, this is a stronger and more flavorful version of what you find in the grocers aisle. However, if you are searching for a true "cinnamon" or "orange" tea - well, you're out of luck. Just like me. Recommendation : If you like the supermarket version of Orange-Spiced Tea, then you'll love this tea. Otherwise, for those searching for highly flavorful "orange" or "cinnamon" teas, keep searching. Brewing Instructions : Use 1 tsp of leaf. Pour boiling water over the leaves. Let brew for 3-5 minutes. I found very little taste difference between the 3 minute and 5 minute brewing times.